Nearly four months after the mass resignation of the South African Airlines board over unwelcome government interference, followed soon after by the departure of its CEO and several senior executives, the carrier has plunged to new lows with the suspension of its acting CEO. Vuyisile Kona was suspended from his job on 11-Feb-2013 while “certain allegations that have come to the attention of the board” are investigated. CEO of SAA LCC subsidiary Mango, Nico Bezuidenhout, has taken over as interim CEO, the third head of the company since 2009. He will now lead the committee developing the strategic plan that is now due by the end of Mar-2013. Equally concerning to the allegations levelled at Mr Kona is the failure of the senior management team and government officials to deliver the strategic plan needed to support on-going state financial assistance of the troubled carrier and ahead of the appointment of a new permanent CEO. SAA has already been forced to draw down two emergency loans totalling more than ZAR1 billion under a ZAR5 billion (USD564.2 million) guarantee scheme to meet its working capital requirements. Leadership difficulties at SAA under Mr Kona had become increasingly apparent with details of the turnaround strategy to secure ZAR5 billion (USD564.2 million) in government guarantees granted in Oct-2012 missing deadlines in Dec-2012 and Jan-2013. As a result the target to appoint a new CEO by 15-Jan-2013 also passed. The board is expected to recommend a candidate to Minister of Public Enterprises Malusi Gigaba by the end of Mar-2013. There are concerns, however, because Mr Bezuidenhout, as acting CEO, will not see through the strategic plan that the committee he is leading will present to the government. Details of what Mr Kona stands accused of are thin, but it appears they involve alleged breaches of the Public Finance Management Act, implying the mismanagement or misappropriation of public funds. Mr Kona has reportedly said that he was “not fully clear” about what the allegations were against him. He is also refusing to resign, saying it is up to the board to prove the allegations against him. “The airline is in dire need of leadership. Anyone can resign, it is the easiest thing to do, but these actions are not helping the leadership problem,” Mr Kona told Business Day Live on 12-Feb-2013. Opposition politicians have also demanded that Minister Gigaba and the board explain the reasons for the suspension. Allegations against Mr Kona also follow an 11th hour deal he struck with the National Transport Movement in Jan-2013 to avoid a strike. The NTM had sought recognition as a union from the carrier, even though it did not represent the required 30% of SAA employees who are part of the bargaining unit. Mr Kona had promised to present the union’s concerns to the board. SAA’s board subsequently said any promises made by Mr Kona to the NTM were “null and void”. Mr Kona was appointed on 28-Sep-2012, originally as chairman, then adding the role of acting CEO when CEO Siza Mzimela resigned on 08-Oct-2013. He relinquished the chairmanship to Dudu Myeni after the board expressed their concerns to Minister Gigaba that the combined role of chairman and CEO was not governance practice. Mr Kona was tasked with the development of a new strategic plan for the SAA Group including South African Express and SA Airlink, in support of further government assistance, including details of financing for the airline’s planned purchase of short and long-haul aircraft. Mr Kona reportedly favoured consolidation to create a larger airline, better able to compete in the tough international market. SAA in 2013 will start taking delivery of the first of 20 new A320 aircraft to replace its less efficient mixed Boeing 737-800 and A319 fleet. The new aircraft, which will give SAA an all-Airbus passenger fleet, will be delivered through to 2017. Over the same period SAA plans to expand its long-haul fleet from 24 aircraft to 31. Requests for proposals (RFPs) were issued to both Airbus and Boeing in Jun-2012 for new widebody aircraft, to allow the carrier to respond to competitors and meet demand. 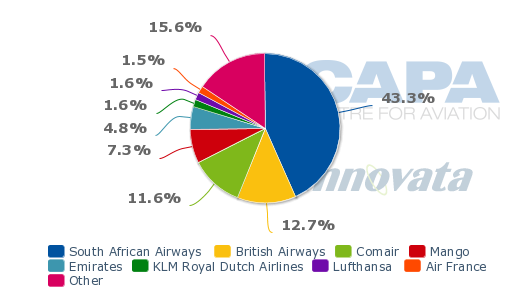 SAA commands about a 43% market share, deploying about 44% of its seats in Southern Africa. SAA is renegotiating its purchase agreements for the A320 fleet in a bid to free up a reported ZAR1.2 billion (USD135.4 million) in pre-delivery payments. The aircraft will instead be leased. This together with a planned two-year bond programme to raise ZAR1.5 billion (USD169.3 million), backed by the government guarantee, will normalise SAA’s cash requirements “for a considerable period of time”, CFO Wolf Meyer told Business Day Live. SAA’s on-going financial support includes a ZAR5 billion (USD564.2 million) government guarantee granted on 02-Oct-2012 for a two year period effective 01-Sep-2012. The guarantee is intended to enable SAA to borrow on the financial markets. Of the total guarantee, ZAR1.5 billion (USD169.3 million) was set aside for working capital. SAA took advantage of the guarantee for the first time in Dec-2012, receiving an emergency loan of ZAR550 million (USD62 million) to ensure it had sufficient working capital to continue operating. 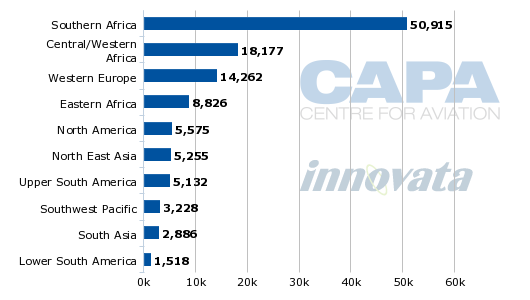 The carrier took out a second loan, for ZAR570 million (USD64.3 million) in early Feb-2013. The Dec-2012 loan is repayable in Mar-2013, for which SAA can use the remainder of the ZAR1.5 (USD169.3 million) billion facility. SAA has repeatedly had to ask the government for assistance over the last several years as multiple restructuring attempts have failed. But, faced with repeated government reluctance to support substantial restructuring of the company, it is hard to see any new moves achieving more than a temporary respite. The requests are also controversial as they distort the playing field of what is supposedly a deregulated market. However, the government on 10-Feb-2013 dismissed concerns that the support funding was detrimental to private airlines like Comair and its subsidiary Kulula Air, claiming the market was “very competitive”. SAA, Mango and Comair have also objected to fastjet’s bid to relaunch South African LCC 1time under the fastjet brand. 1time was placed in provisional liquidation on 11-Dec-2012. fastjet has offered to buy the assets of 1time for ZAR1 (USD) and offer domestic services between South Africa’s main cities. The South African airlines have lodged objections to the takeover with the Air Services Licensing Council on the basis that airlines operating domestic services within South Africa must be 75% owned by South African residents. Tanzania-based fastjet is majority owned by London Stock Exchange listed Lonhro, and so does not qualify. fastjet has applied to the South African Minister of Transport for an exemption to the rule. Mango pointed to the failure of 1time as well as LCC Velvet Sky earlier in 2012 as being indicative that the market was over-served with capacity. Allowing 1time to be re-established as fastjet risked one of the existing carriers to fail, Mango claimed. 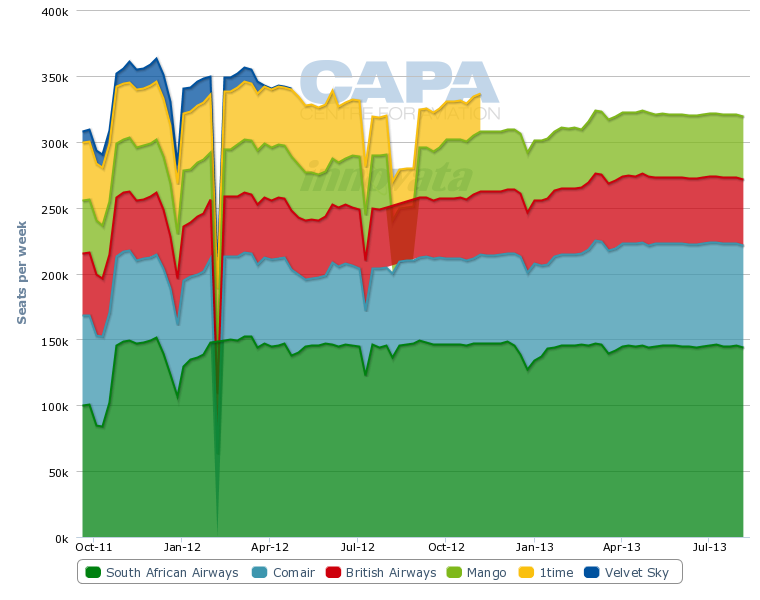 The benefits of less competition are apparent in Comair’s listed results with the carrier reporting a tax-paid profit of ZAR79.1 million (USD8.9 million) for the first six months to Dec-2012, turning around a ZAR34.2 million (USD3.9 million) loss for the same period in 2011. The result was achieved on 20% revenue growth to ZAR2.42 billion (USD273,000) largely due to fuel surcharges on British Airways' services and improved yield management on LCC subsidiary Kulula Air, despite reduced domestic demand, according to the carrier. South Africa’s two biggest airports, Cape Town and Johannesburg Oliver R Tambo, recorded domestic passenger reductions of 4.8% and 8.9% respectively year-on-year for Jan-2013. Overall traffic numbers were 5.6% down to 701,881 at Cape Town and 3.6% at Johannesburg to 1.5 million. Domestic capacity has reduced by about 39,000 seats to about 310,000 over the past 12 months, largely due to the demise of Velvet Sky and 1time. Mr Bezuidenhout plans to expand Mango in 2013 taking advantage of Africa’s 5% overall economic growth forecast, well above the global average. He also pins his hopes on the “progressive realisation of the Yamoussoukro Declaration” (YD) creating open skies across the continent to accelerate Mango’s growth beyond South Africa. There has, however, been little progress in liberalising African airspace since the YD was ratified by the majority of African states in 2002. Mango was considering several new routes, particularly to East Africa over the next 18 months, is a strategy similar to that of fastjet which aims to be a pan-African LCC, in part through the rebranding of its Fly540 operations in Ghana and Angola. The process of appointing SAA’s CEO is utterly embroiled in politics and it appears unlikely that applications for the job will include many well-qualified leaders that the airline needs. Rather a permanent successor to Ms Mzimela will be someone prepared to tow the government line. Minister Gigaba has reiterated the government’s interventionist style, reportedly saying on 13-Feb-2013 that he will not hesitate to intervene again if management does not deliver. “We respect the difficult decision that the board had to make. We will assess it and make further intervention. Our focus is the well-being of the company and the employees, and the well-being of the economy,” a spokesman for Mr Gigaba said. This approach gives little confidence that a new leadership will be given the mandate to implement any strategic plan calling for the massive restructuring that is so necessary to stem losses. History also does not bode well, over the years nine restructuring plans have been presented to the government, none have been implemented.